In the course of seven years, I've published 438 articles to this blog. That's a little more than one per week, which has been my goal, believing that I should publish often enough to keep folks interested, but not so much to become just white noise. The cost of running our school district is, and will always be, a function of the number of folks we employ and how much we pay them. I believe that the time has come when we must have an earnest conversation about whether we can continue to afford the expansive programming we offer, especially at the high school level, in both the academic and extracurricular dimensions. The regular appearance on the ballot of the property tax levies necessary to fund the rising cost of this level of programming will meet increasing resistance from voters, and our high tax rate will jeopardize our property values. But cutting our programming to the bone and becoming a less-desirable school district will hurt our property values as well. We'll have to make our choices very carefully, and with a lot of dialog. And it can't be done successfully with the abysmal community engagement we saw in the November election, with only 13% turnout. Of the 56,488 registered voters in the Hilliard City School District, only 7,348 bothered to show up. That's fewer than half the number of students we have enrolled in the district - for an election in which three of the five School Board members would be determined. There's probably more folks at one of our intra-district football games. Granted, we, the leaders of our school district, should do a better job of creating opportunities for you to be engaged in these necessary conversations. I hope we take on that challenge in the coming year. 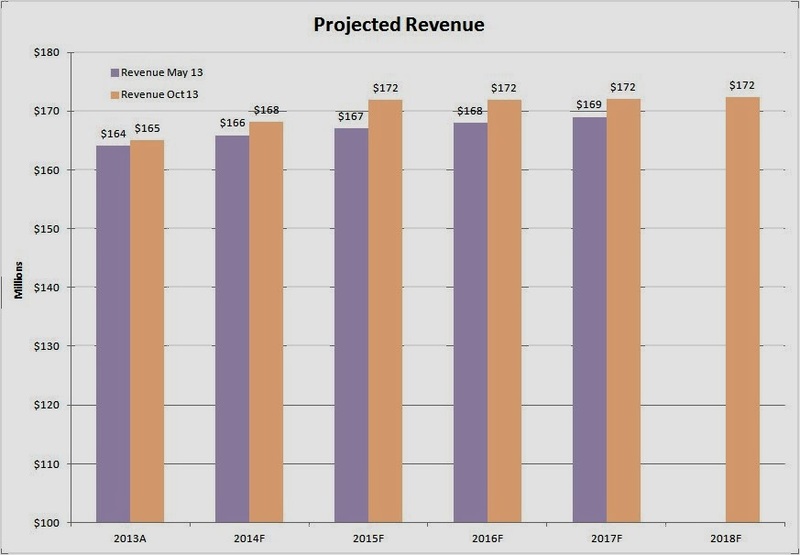 Our revenue will always be a mixture of local property taxes and funding from the State of Ohio. As long as our state and national politics remain so polarized, the state funding component will continue to be volatile. That means we need to keep a reasonable cash reserve on hand to give us time to make good decisions when state funding drops, rather than having to react to an immediate fiscal crisis. And until our local city leaders - Hilliard, Columbus and Dublin - decide that it's more important to protect the current residents of our community than it is to provide profit opportunities to residential real estate developers, we need to understand that when a new housing development goes up, the rest of us are likely going to end up subsidizing the cost of educating the kids who will come with it. By the way, I say that with the understanding that it may well be thought to be hypocritical for the School Board to enter into an agreement to sell 100+ acres to a home developer. This is a unique and unfortunate situation, and I've explained how I came to support this decision. Since the deal fell through because of the unexpected demands put on the developer by the City of Hilliard, we have one more chance to explore options. Who knows? Regardless, the general economic health of our public institutions - both the School District and municipalities - depends on bringing in businesses at a rate comparable to residential development. Or rather, the rate of residential development should be managed so as not to exceed the rate of new commercial development. It can be done as simply as refusing new annexation requests for residential development until a good more commercial development takes place. An expanding school district doesn't count as commercial development, even though Hilliard City Schools is the largest employer in the City of Hilliard. 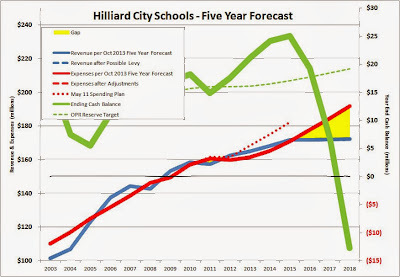 The income taxes paid by the teachers and staff of the School District may help fund the City of Hilliard, but that money starts out as property taxes paid by the residents and businesses already here in our community. What we need are more employers who get their revenue from outside the school district, like BMW Financial and Verizon. I'm sure that every once in a while, some issue will come up which merits some explanation, analysis or comment, but otherwise I'll not be trying to keep to a one-article-per-week pace going forward. I also hope that soon all the supplemental materials for our School Board meetings will be provided directly on the district website, along with the meeting agenda. Meanwhile, if you have a question or issue you want me to address, please send an email, and I'll be happy to do so. 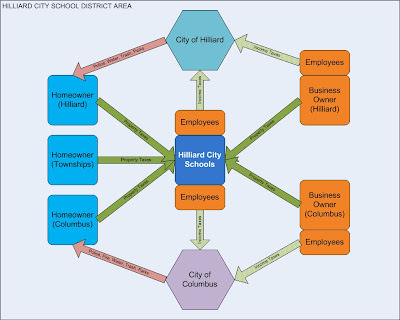 Notice is hereby given; there will be a SPECIAL meeting of the Board of Education of the Hilliard City School District on TUESDAY, DECEMBER 17, 2013 at 6:00 P.M. located at the McVey Innovative Learning Center Annex, 5323 Cemetery Road, Hilliard, Ohio. The meeting will be held in regular session to discuss regular business as deemed necessary by the Board of Education and any other business that may be lawfully considered. I believe the only item on the agenda will be to approve a new 3 year agreement with the employees represented by the Ohio Association of Public School Employees (OAPSE). I'll publish the final version when available. The base compensation increases are the same as for the Hilliard Education Association (2% each year of the contract), with the same changes to the health insurance plan design. Here are the supplemental materials provided in preparation for the regular meeting of the School Board, to be held Monday December 9, 2013 at 7pm at Weaver Middle School. This will be the last regularly scheduled Board meeting for 2013. A large majority of folks say the community and the school district is "going in the right direction." More folks said "managing the budget/cutting costs" should be the top priority than any other choice. 86% said the quality of education provided by the district is Good or Very Good. 30% approve or strongly approve of the job being done by the School Board vs 9% who disapprove. But 60% said they don't know or don't care. This apathy is what's going to kill America. Less than half said we should increase the access to technology. About the same fraction said we have enough access to technology now. Less than half said we should more more emphasis on building security. More folks said we are good where we are. Best sources of information to evaluate the quality of the district? More said the teachers than any other response. Next was students. Best source of general information about the schools? #1 is the newspapers, followed by the district "E-News." Here's a critical demographic: 62% of the respondents don't have kids in our schools. Item F1 is mandated by the Ohio Revised Code and our own Policy KH to allow the school district to accept various items which were donated this year. We thank the efforts and generosity of the contributors. Item F2 is an amendment to our appropriations. This is the legal mechanism required to take possession of additional revenue made available to us. Item F3 is the 2014-2015 school calendar. Many times on this blog I have stated that 86% of our budget is spent on compensation and benefits. To clarify, we spend 86% of our General Fund budget on compensation and benefits. This is the part of our financial structure into which the property taxes generated by operating levies are collected, as well as the funding from the State of Ohio. It is from the General Fund that we pay almost all of the compensation and benefits, buy books, pay the utility bills, and fund the cost of the everyday operations of the district. It is the General Fund we're dealing with when Treasurer Brian Wilson presents the Five Year Forecast to the School Board. 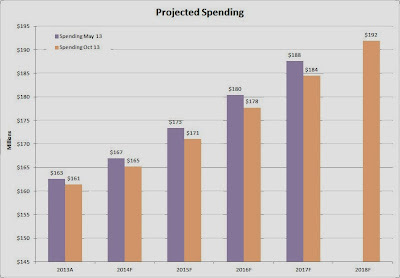 The General Fund Budget is $167 million for FY14, or 82% of the total budget*. That means compensation and benefits are 71% of our overall annual spending, used to employ 1,683 people, all who directly or indirectly support the education of 15,838 students. A comment often heard is that we're "top-heavy with administrators." A parent said that to me last week. As a candidate for the School Board, Brian Perry said this was something he wanted addressed, and a lot of voters agreed with him. Maybe it's because I spent a lot of years in management, but I think the opposite might be true. I'm not sure we have enough administrators given the amount of work they have to do. In particular, I'm concerned about the principals and assistant principals because of the new workload placed on them by the Ohio Teacher Evaluation System (OTES). Many of us - me included - would like there to be an accurate, fair and trusted methodology created for evaluating teacher effectiveness so that we can reward teachers accordingly. As my friend Marc Schare says (who was just re-elected to his third term on the Worthington School Board), under the current step-and-lane compensation system, some teachers are overpaid, and some are underpaid, and we can't fix either problem. OTES might be step towards getting there, but part of the cost is the time burden it puts on both our teachers and administrators. So what is the makeup of our administrative team? Each of our 17 elementary buildings has one principal. Assistant principals at the elementary level were eliminated several years ago. These 17 principals supervise about 340 classroom teachers, plus many other professional staff, and are collectively responsible for 8,300 kids. That's a ratio of 20 regular classroom teachers and 488 students per administrator. Our 3 middle schools each have a principal and an assistant principal. I don't have the count of teachers at the middle school level, but there are 2,415 students, making the ratio 402 students per administrator. The three high schools each have one principal. Bradley and Darby each have 3 assistant principals, and Davidson has four. Together they are responsible for 4,803 students, for a ratio of 300 students per administrator. Each high school also has an athletic director. The superintendent, treasurer, and two assistant superintendents. 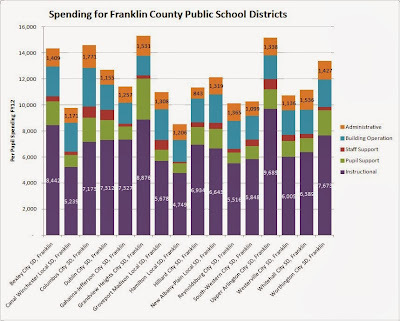 Notice that we have the lowest Administrative cost per pupil of any district in the county - by far. So I don't agree that we have too many administrators, or that our management structure is too top-heavy. Compared to corporate environments, I think we run pretty thin. That's not to say that I think our cost per student is exactly where it should be. That too is a matter of opinion, and can be answered only in the context of the strategic questions I pose at the top of this article. 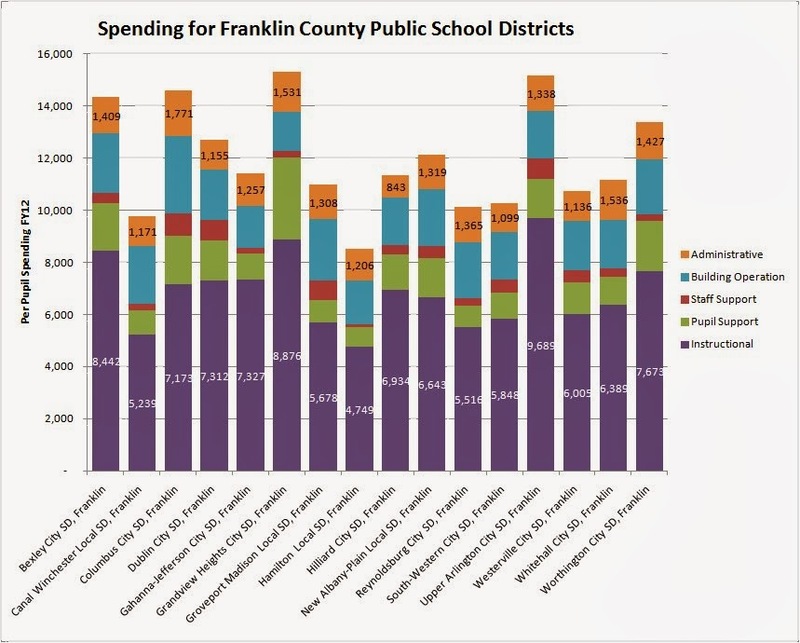 Some districts in our county spend a good deal more per student, such as Bexley, Grandview Heights, and Upper Arlington. This is in part due to the richness of their programming, and in part because of their compensation structure. Columbus City Schools also spends a lot per student, I suspect in part because of the large amount of intervention services they must provide to their vast numbers of students from poverty. However, they also have an extremely high administrative cost. We need to have an ongoing dialog about how much money we spend for what, and we also have to recognize that we are not of one mind in regard to the answers. But I hope we do agree that the relationship between the perceived quality of the school district and the taxes we must pay to create that quality influences the desirability of our community, and hence our property values. The best situation would be to have low taxes and high perceived value. There are probably some districts which fall into this category, but I can't think of any. Indian Hill down near Cincinnati has a very low tax rate, but it also has the second highest property valuation per pupil in the state - virtually all of it residential. In spite of a very low tax rate, they still have enough money to spend $15,740 per student, with 84% of generated by local taxes. The worst is to have high taxes and low perceived value. The districts who initiated the DeRolph case many years ago probably felt they were in this category, as they had fairly high property tax rates, but it generated little revenue because property values are so low. This is the situation which led the Ohio Supreme Court to declare that funding system as unconstitutional. We are in neither extreme. Our taxes feel too high to many folks, but they're that way primarily because we're a relatively affluent bedroom community (meaning we get less state funding support than rural and urban districts) where residential development has been allowed to significantly outpace commercial development. But we also have one of the most desirable school districts in the region. Yes, we can probably get by with less. The challenge is getting a majority of people to agree what we can do with less of so we can invest more for the future, and keep the desirability of our schools - and hence our community - high. I hope you participate in the discussion. * The budget actually says $227 million. The difference is due to the way our medical benefits are accounted for, with there being a $25 million expense recorded to the General Fund which is then recorded as revenue to the Proprietary Funds, which is where we pay out actual medical expenses for our employees. Nothing sneaky, just the way the accounting works for government entities. For those of us used to corporate accounting, it makes sense to wash this out, just as would be done when rolling up a subsidiary's books to the parent. Here are the supplemental materials provided in preparation for the regular meeting of the School Board, to be held Monday November 25, 2013 at 7pm at JW Reason Elementary School. Item C2 of the agenda is to approve the Treasurer's Monthly Financial Report. I see nothing out of the ordinary. Item E1 includes the list of salary supplementals paid for coaches and advisors for winter semester activities. Item F1 is the third reading and adoption of a number of policies. Ohio's school funding approach splits the responsibility for funding public schools between the state government and the local school district. Some argue that the Ohio Constitution requires the state government to provide sufficient funding such that every school school district can deliver a "thorough and efficient education" without the need for local funds. This was the basis of the Derolph vs State of Ohio lawsuit which resulted in the Ohio Supreme Court declaring Ohio's school funding system to be unconstitutional. By the way, the Supreme Court never said that property taxes were unconstitutional. Their problem wasn't with property taxes, but rather that the state portion of the funding was inadequate for the districts with low property values, necessitating unreasonably high local property taxes to adequately fund their schools. It's also worth mentioning that the DeRolph decision is now moot, as the funding scheme it addressed has been replaced twice, first by Gov. Strickland's Evidence Based Model, and then by the approach introduced by Gov. Kasich. The current scheme is constitutional by default until a new lawsuit is filed and the courts rule otherwise. Apparently no one feels it is worth going through that exercise again. Constitutionality is not the subject of this article. Rather I want to explain how property taxes are calculated, and in particular to address what happens when the County Auditor reassesses property values every three years. You may have heard "HB920" mentioned, especially when there is a levy on the ballot. HB920 was enacted by the General Assembly in 1976. It was designed to protect homeowners from being "taxed out of their homes" as a result of rapidly rising property values, and it does so by keeping property taxes constant while property values rise. The Bill was championed by George Voinovich when he was the County Auditor of Cuyahoga County, and the neighborhood called "The Flats" was being regentrified. Some folks will lament that HB920 "prevents property tax collections from rising automatically with inflation," as though that is a bad thing. As I've written for many years, I think this is a good thing, as it forces school leaders to go before the taxpayers when there is a desire to increase spending. I think that level of accountability is very healthy. Let's get started by imagining a school district in which there is only one piece of real estate, a home with a market value of $100,000. That homeowner has voted to allow 2 mills of taxes to be levied to fund the school district. "Mills" are tax lingo, and simply means 0.1%. So a 2 mill tax rate is the same as 0.2%. One would think this means that a 2 mill (or 0.2%) tax on a $100,000 property would yield an tax bill of $200. But at some point in the past, Ohio's lawmakers decided to adjust the taxable value of real estate by setting the "assessed value" of property to 35% of the market value. I imagine this came to be at some time when the General Assembly decided to reduce property taxes across the board. As a result, under current law this 2 mill levy would apply to $35,000 not $100,000, and the tax bill would be $70.00 per year. Then another home is built in the school district - this one valued at $200,000. The same reduction to 35% of market value is applied, yielding a tax of $140.00. Note that the total tax collected by this levy is $210.00. As long as these are the only two properties in the school district, this $210.00/yr is all that Levy #1 is allowed to collect, regardless of changes to the market value of the properties over time. As required by HB920, the total amount collected by Levy #1 remains $210/year, but the amount of tax paid on each home has changed. Added to the calculation is the "Reduction Factor," which is simply the amount of tax collected at the original valuations divided by the amount of tax that would be collected at the full rate with the new valuations. In this case, it's $210.00 divided by $224.70, yielding a Reduction Factor of .934579. This reduction factor is applied to the tax calculated at the new values, which restores the total tax collected to the original amount, but doesn't necessarily cause the tax collected on each individual parcel to remain the same. Notice what happened in the example above: Even though both homes increased in value, the tax due on Home #1 has decreased, while the tax on Home #2 has increased. That might not seem fair, but it's the way things work. The consequence can be exactly that which was pointed out recently by my neighbor, Mike Harrold: the tax burden shifts disproportionately to neighborhoods where home values are rising the most. Kind of a double whammy. There is no reduction factor applied to the new tax - it is charged against the Assessed Value at the full rate, and will remain so until there is another reassessment of property values. As you see, it's not true that "Once a levy passes, it never generates more money," which is something which has often been claimed by levy campaign committees in past years. New properties do generate additional revenue, at the same effective tax rate as all the other properties in the school district. It may not be enough to fund the cost of the additional students which come with new homes, but that's a different story. So one powerful consequence of HB920 is that it protects the taxing entity - in this case the school district - when property values go down. In other words, just as taxes don't rise as property values increase, neither do property taxes decrease - in aggregate - when property values decline. I think a lot of people were surprised by this when the housing bubble popped a couple of years ago. This is also why school districts didn't get nailed in the same way as did other governments when incomes fell off in the Great Recession. Granted, when the state budget took the hit from falling income tax revenue, that directly led to a decrease in the aggregate funding from the state to education. However, the impact was not equal across all school districts. The more affluent districts - and we're seen to be one of those - had larger reductions, implemented primarily via an acceleration of the phase-out of reimbursement of Personal Property Tax income. As tax revenues have recovered for the state government, some of the reductions to us have been restored, which is the primary reason why we can say that another levy should not be needed before 2015. 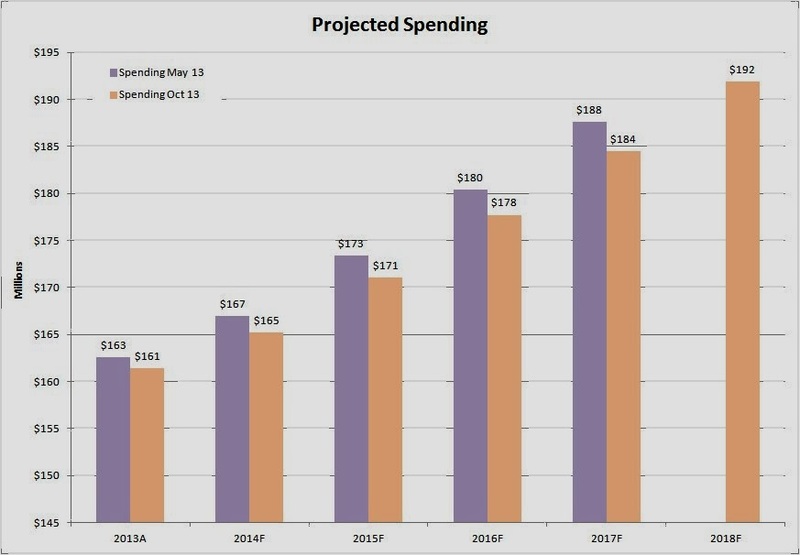 It was looking pretty bleak there for a while, to the point that I was fairly confident that we couldn't make it to even 2014, our commitment when we put the last levy on the ballot, without some painful cuts to programming and services, achieved in the only way we can - to reduce personnel expenditures. 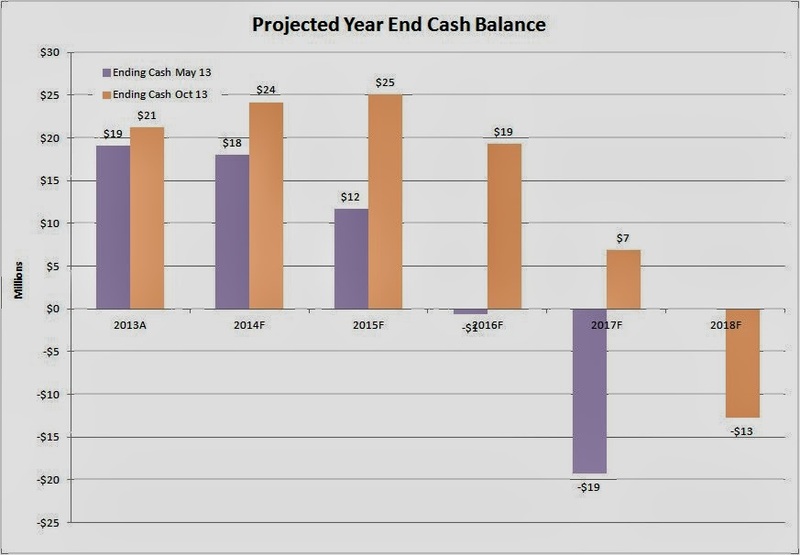 This is the reason I voted twice to not accept the Five Year Forecast from our Treasurer. Things obviously look better now, allowing us to negotiate a reasonable deal with the teachers and still not need to put a levy on the ballot until 2015. Can we maintain the richness of offerings at our high schools and keep the rate of expense growth such that it can be funded with reasonable levies at reasonable intervals? What things should we consider in regard to the health care coverage for our employees that changes the trajectory of these costs? If Obamacare survives, we're going to run right into the Cadillac Tax unless we make some significant changes to our plan design. Paying this tax makes no sense at all. Is it time to look at income taxes as a component of our funding strategy? How about an Earned Income Only Tax? As I've disclosed before, an Earned Income Tax is particularly attractive to retired folks like me, but it narrows the tax base, leaving out not only retirees but also the corporations, who pay only property taxes. In other words, it transfers more of the incremental funding burden to folks still working, who also tend to be the folks with kids in school. As always, my mission is to educate the voters of our community so that we can have an informed dialog about these matters. I hope you will participate. Now that the election is over, and the composition of our school board is set for the next two years, it might be worth a reminder of what it is the Board of Education of an Ohio public school district is supposed to do. Section 3313 of the Ohio Revised Code answers much of that question, plus there are a great number of other requirements placed on school boards in other sections of the state law. One can get a sense of what those requirements are by looking back through the minutes of prior meetings and reading the resolutions which were acted upon. With few exceptions, those resolutions were mandated by something written into a law. For example, the law requires that school boards must review and approve the Five Year Forecast twice each year. Look at the minutes for May and October, and you'll see resolutions to that effect. So while a school board must perform certain duties as dictated by the law, a school board has the ability to engage in pretty much any matter it cares to when it comes to the school district - nothing is off limits. That doesn't mean it's a good idea for the school board to participate in the day-to-day details. This is perhaps why the Ohio Revised Code requires each school district to also have a Superintendent and Treasurer, who serve as the executive officers of the school district, reporting to the school board, but with their own statutory responsibilites. Clearly the state lawmakers believe that governance and management are separate roles. So do I. But what is the difference in those roles? This is a point of debate and often tension between governing bodies and executives in all kinds of organizations, not just school boards. Shareholder-owned, for-profit corporations have Boards of Directors and Chief Executive Officers. Many not-for-profit organizations do as well. I have served on both kinds of Boards, and have at times been witness to a divergence of opinion between the Board and the CEO. It's never fun, but neither is it something to be avoided when the success of the organization requires it. In the corporate world, this tension is sometimes prevented by naming the same person to be the Chairman of the Board of Directors as well as the Chief Executive Officer. While this may streamline the decision-making process, it can also lead to out-of-control management. Since the meltdown of the stock market precipitated by the collapse of companies like Enron and Worldcom (briefly my employer), having both roles held by the same person is viewed much less favorably. The Founding Fathers set up the federal government of the United States of America with three branches, each of whose powers are limited by the other two. Within that, we have a legislative branch with two houses which must agree on exact language before a law can be enacted. One can complain that this structure is inherently inefficient, but the objective of the Founders was never efficiency - it was restraint of power. The Founding Fathers thought it was okay if the federal government would have a hard time generating new legislation. After all, they were generally in favor of less government, not more. Nonetheless, Congress can be acquiescent to a popular or powerful President. Lyndon Johnson is said by some to have been the most productive President the post World War II period, based on the number of initiatives championed by his administration which made it to law. He also had the advantage of holding the Presidency at a time when his party had held the majority in both houses of Congress for 26 of the prior 30 years. And it is often said that the members of Congress feared LBJ because he was a bully, and they weren't really sure what dirt he might have about them. These days our federal government is almost dysfunctional because the Senate and the House of Representatives are ruled by two different parties, and the President has been unable, or unwilling, to build a workable middle ground. That too has happened from time to time in the history of our country. It has a way of working itself out - when the people grow tired of the shenanigans and start replacing incumbents who thought they were safe. So how does this relate to public school boards, you ask? After all, the superintendent of a school district isn't directly elected by the people, as is the President of the United States. The superintendent is hired by the school board, evaluated by the school board, and has his/her contract renewed (or not) by the school board. How can there be any conflict? In this case, it might be helpful to look not at the model of the relationship between the President and Congress - both elected positions - but rather between the President and the officers in charge of the military, the latter whom are appointed by the former. While Presidents are limited by the 22nd Amendment to no more than two terms in office, the top military officers serve for their whole adult life. When President Obama graduated from high school, Martin Dempsey, the Chairman of the Joint Chiefs of Staff, was already a Major in the Army. By the time Mr. Obama was elected President, without any prior executive leadership experience, Dempsey had risen to the top of our military command structure as a 4-star General, having commanded hundreds of thousands of troops and received extensive training in international affairs. Note the character's use of the term "temporary occupants of the White House." He clearly has disdain for the notion that folks he perceived as amateurs should be allowed to control the actions of lifelong, professionally trained, experienced military officers. Of course, that got MacArthur fired - Trueman wasn't about to let The General or any other military leader threaten our system of government. I think similar dynamics happen in a public school district. While in abstract it is true that the school board appoints the superintendent, the fact of the matter is that school board members come and go while superintendents often hold their jobs for many years. During the 34 years my wife and I have lived in our school district, there have been I think only three Superintendents prior to our hiring of John Marschhausen this year: Dale McVey (2000-2013), Roger Nehls for ten years or so before him, and before Mr. Nehls someone I never met. In that same period, 26 different people have served on the school board, 17 for only one term. Very few were professional educators. So one can understand a Superintendent being wary of a school board that gets too engaged. But a school board has to willingly abdicate its authority to the superintendent - the superintendent can't take it away. Strong superintendents will fill the vacuum left by a board that doesn't exercise its lawful authority, and if that condition is allowed to exist long enough, it will become the cultural norm. This is exactly what happened with Columbus City Schools in my opinion - a deadly combination when the superintendent is not effective. I'm grateful to have been one of the few board members who in the last 30 years has had the opportunity to participate in the hiring of a new superintendent. I think we did a good job in hiring Dr. Marschhausen, and hope that he too will serve our district until his retirement. During that time, I suspect the Hilliard School Board will have had a number of new members, and the unique relationship Doug, Andy, Lisa, Heather and I have with Dr. John - being the Board who hired him - will be replaced by new relationships with people whose names aren't even on our radar. It's therefore crucial that the roles of the Board and our new Superintendent be well defined now, and sustained through successive generations of the Board. Here are the supplemental materials provided in preparation for the regular meeting of the School Board, to be held Monday November 13, 2013 at 5pm at the ILC Annex (formerly the Central Office Annex). Please note the change in time, adjusted so that a couple of our folks can make it to their childrens' school activities that evening. Without a doubt, the most significant item on the agenda is F1, a resolution to accept the tentative collective bargaining agreement we have negotiated with the teachers' union, the Hilliard Education Association. In various shifts, all five members of the School Board participated in the negotiation of this agreement, and it is my expectation that the resolution will be adopted unanimously. I'm not an expert in labor law - none of us on the School Board are. So we retain the services of Don Scriven, a partner in the law firm of Scott, Scriven and Wahoff, to advise us. Mr. Scriven has represented the School Board for a number of years. Likewise, the teachers negotiate with the assistance of an attorney from the Ohio Education Association. Rather than starting with a clean sheet of paper, labor agreements are negotiated via a process that begins with the parties exchanging proposals as to how they would like various articles in the existing agreement to be changed. One party says "we propose these changes to A, B, and C," and the other says, "we propose these changes to C, X and Y." Then the negotiations would proceed on A, B, C, X and Y only - the rest of the contract is not brought into the dialog. In the course of the negotiation, the parties might agree to take items B and Y off the table, leaving the negotiations to be about A, C and X only. Perhaps agreement on X is reached quickly, but A and C, which might be related, take more time. Eventually (hopefully), "tentative agreement" is reached on all items. That tentative agreement is first presented to the union membership for their ratification. This step has been taken, and the teachers agreed to accept the tentative agreement. The last step is for the School Board to accept the tentative agreement, which is the purpose of item F1 on the agenda. At this stage, the tentative agreement is not in final contract form. Rather it is a collection of markups of the prior agreement (which is the 2008-2010 agreement in this case), initialed by representatives of the two parties. If the School Board passes the resolution to accept this tentative agreement, the final contract will be drawn up, and the duly authorized representatives of each party will sign. So the real question, what has changed in the new agreement? Because the tentative agreement shows all the markups, I'll not address every change here - you can easily find them. But what most people will be interested in is what changed in regard to compensation and benefits, which represent 85% of the district's operating budget. First, I would encourage you to read an article I wrote in 2010 to explain how teacher compensation works in our district, which is structurally identical to virtually every other district in Ohio, and is commonly used in similar form across the country (go here to examine the labor agreements for other public sector unions in Ohio). It is in essence a three-dimensional matrix which considers length of employment (steps), the level of education of the teacher, and a base salary number. This contract resumes the 4.15% normal steps and 6% educational columns, although we need to remember that in the 2011-2013 agreement, one step was permanently skipped. This means that teachers with N years of experience are paid according to step N-1. So the only change to the pay grid is the base salary. While the 2011-2013 agreement had no increases in the base pay for those three years, this new agreement has a 2% increase in the base pay in each of its three years. Therefore teachers on steps 0 to 15, plus steps 20 and 23, will receive a 4.15% step increase and then a 2% base pay increase each of the three years of this contract (ie a combined 6.233%). The rest of the teachers will receive only the 2% base pay increase each year. Any teacher who reaches one of the target education levels will receive a 6% increase in addition. However, in conjunction with these salary changes, the School Board requested changes to the design of the health insurance package to reduce the cost borne by the taxpayers to provide coverage to the teachers and their families. Some may recall that prior to 2008, the employees of our district made no contribution to the cost of the premium we paid for our health insurance. In the 2008-2010 agreement, the School Board negotiated a change to this (and it was a difficult negotiation), increasing the employee's share of the premium from zero to 10% in 2010 (ie the taxpayers still paid 90% of the premium). In the 2011-2013 agreement, the employee share was increased to 15%, and it remains this in the tentative agreement. You may also recall that in 2010, the School Board and employees agreed to convert to a self-insured system, meaning we now pay directly for all claims, albeit with stop-loss coverage to limit our risk. So rather than there being a premium per se, the Insurance Committee (on which I sit), examines the claims history each year as well as our insurance fund balance, and determines the employee contribution necessary to fund the plan for the coming year. Therefore the 15% refers to the percentage of this contribution, which is currently $1,605.93 per month for family coverage, making the employee share $240.88 per month. What is less obvious are the parameters of the coverage. Up to now, the employees had neither a deductible nor any co-insurance liability. In other words, if an employee (or covered family member) had a $10,000 medical procedure, the cost to the employee was zero - we taxpayers covered it all. In the new contract, the deductible will be $250 for 2014, stepping up to $500 for 2015-16, and the co-insurance amount will be 5% in 2014, becoming 10% in 2015-16. At the same time, a family "out-of-pocket" maximum has been implemented (which is unnecessary if there is no deductible or co-insurance) of $2,000 in 2014, $2,500 in 2015, and $3,000 in 2016. Therefore in the event of a $10,000 medical procedure, the employee in 2014 would pay the $250 deductible, plus 5% of the remaining $9,750, or $488, for a total of $738. The school district would pay the remaining $9,262. If the same procedure were to take place in 2016 or later, the employee would pay the $500 deductible, plus $950 in coinsurance for a total of $1,450, leaving the school district with responsibility for $8,550. This is still excellent coverage, at least compared to the medical insurance I have, which includes a $1,500 individual deductible, 20% co-insurance, and a $5,000 family out of pocket max. This $10,000 procedure would cost me $2,500. I suspect many of us in the community have plans similar to mine, although HSA/High-deductible plans are becoming much more prevalent. The big question mark remains on what changes the Affordable Healthcare Act will cause, should it survive in something like its present form. We know there is a potential collision out there, when the so-called "Cadillac Tax" provision comes into play in 2018. Our health insurance consultant has projected that if no changes are made to our plan design, we could trigger this tax. In future years, we need to discuss the merits of plans based on a different structure, such Health Savings Accounts with high-deductible coverage. It's always about the apportioning of risk between the employer, the employees as a group, and the employees as individuals. The effect of this insurance plan change will be to offset some of the cost to taxpayers of the salary increases. How much we won't know for a while because when you change the plan parameters, you also change the behavior of the folks who are covered. We don't want folks to put off going to the doctor until they're really sick, so the plan design continues to encourage preventative care, which is further encouraged via our wellness programs. Nor do we want folks to suffer when they get hit with really big medical bills. But we want them to be wise consumers of medical care, and being exposed individually to a little more of the cost should foster that. I feel this new collective bargaining agreement is a reasonable deal. Nothing about it changes our statement that no levy will be on the ballot before 2015, provided the General Assembly honors their current biennial budget. That doesn't mean we can stop looking for ways to moderate the rate of spending growth. I feel some tough conversations about the breadth of our programming, particularly at the high school level, are still needed. Your feedback is welcome, but as always, I'll require that it be rational and respectful. Notice is hereby given; there will be a CHANGE in meeting time of the Board of Education of the Hilliard City School District on WEDNESDAY, NOVEMBER 13, 2013 to 5:00 P.M. located at the McVey Innovative Learning Center Annex, 5323 Cemetery Road, Hilliard, Ohio. Thank you to all who voted to allow me to continue to serve on the Board of Education of Hilliard City Schools. I am grateful for your trust and support. And congratulations to Lisa Whiting and Andy Teater for also winning re-election. Well done to Brian Perry, who ran a serious and respectful race. I'm sure it's not the last time we'll see this young man's name on a ballot. Ohio law requires candidates for public office to file campaign finance reports with the county Board of Elections. These reports detail where the money came from to run the election campaign, and how the money was spent. I decided early on that I wasn't going to spend much if any money in this campaign, so I took the option of filing a Local Candidate Finance Report Waiver, which is an option created by the Ohio Revised Code, section 3517.10(K)(1), allowing candidates to attest that they will accept less than $2,000 in contributions, and will spend less than $2,000 running their campaign. By doing so, the candidate is excused from having to file campaign finance reports, meaning you won't see one from me. I didn't do yard signs, flyers, posters, t-shirts, pins or anything. My hope was that the people of the community now know me well enough to decide whether they wanted me to serve another term. If that isn't so, then my communications efforts have been in vain. Of course, like Lisa and Andy, I was endorsed by the teachers' union - the Hilliard Education Association - who was good enough to produce a post card that was mailed to a few thousand people in our community. I know this had an impact, especially in this low-turnout election. I kicked in a couple hundred dollars to help pay for the postage, and that was about it for my campaign spending. The money came from $100 I had to deposit to open a campaign checking account, which I did only because the law requires a political campaign to have a bank account separate from the candidate's own money. Other than that $100, I had a total of about $150 in contributions which came from two individuals, meaning I have a small balance left in my campaign account. The other three candidates clearly spent more than I did. If you really want to know how much they spent, and where the money came from, you can request copies of the campaign finance filings from the Board of Elections after the filing deadlines in a few weeks. I'm worried about the way campaign economics have perverted our political system. Thousands of dollars get spent on school board and town council elections. Hundreds of thousands for a seat in the state legislatures. Millions are spent for bigger offices like governor and member of Congress. To be elected the President of the United States, one had better be able to raise a billion dollars or more. You can't get there without having most of the funding come from a decent number of very large contributors, and those folks expect favors in return. That's why the lobbyists own Washington DC, not the people - the lobbyists have the big checkbooks. And it's the lobbyists who are writing legislation these days, not the elected representatives. How many members of Congress do you think have read the Affordable Care Act? I know I'm preaching to the choir. If you take the time to read this blog, it means you're one of the minority of Americans who are engaged in how our country - at least our community - is run, and are likely one of the small percentage of eligible voters who casted a ballot in this election.